In this week’s program I visit with Susan Hunyor, DTN/The Progressive Farmer, who is the Chair of the Agri-Marketing Conference Committee. This is the annual conference of the National Agri-Marketing Association (NAMA). Susan walks us through a preview of the program for this year’s conference. ZimmComm is celebrating 15 years and will be having fun in the Connection Point, Booth 312. The Golden ZimmComm Microphones will be set up to conduct interviews with attendees. It’s an opportunity to tell us about your company or organization and we’ll publish them into the virtual ag newsroom for the conference on AgNewsWire.com. When you visit us you can enter to win a flex Portable, Universal Keyboard & Detachable Stand. We have donated a special Beats Pill+ to the NAMA Foundation Silent Auction too. The winning bidder will be able to select colors for the bluetooth speaker and we’ll order it to be delivered direct to them. It’s going to be a great conference and we hope to see you there. The Bayer national pollinator forage initiative, Feed a Bee, has announced it has reached its goal of awarding grants supporting diverse forage for honey bees and other pollinators in all 50 states. The 50th recipient awarded recently was Gateway to the Arctic Camp in Talkeetna, Alaska. I talked with Dr. Becky Langer, Bayer, about the milestone and success of this program. Dedicated to service and agriculture, the nonprofit camp teaches the significance of serving those in need and the value of hard work through fun activities involving sustainability, farming and environmental stewardship. This summer it will dedicate an entire field as forage for bees and other pollinators where campers of all abilities, including those with special needs, will discover the connection between honey bees and the crops they pollinate. More corn, but less soybeans, wheat and cotton is USDA’s forecast for Prospective Plantings this season. The report released on Friday puts corn planted acres for this year at 92.8 million acres, up 4 percent or 3.66 million acres from last year. Soybean planted area for 2019 is estimated at 84.6 million acres, down 5 percent from last year. All wheat acreage is estimated to be four percent lower than 2018 and all cotton acreage is down two percent. All wheat planted area for 2019 is estimated at 45.8 million acres, down 4 percent from 2018. This represents the lowest all wheat planted area on record since records began in 1919. The biggest hit comes in the Durum planted area for 2019 is estimated at 1.42 million acres, down 31 percent from the previous year. Both spring and winter wheat are down about three percent. U.S. Poultry & Egg Association and the USA Poultry & Egg Export Council officially broke ground on an expansion to USPOULTRY’s existing offices in Tucker, Georgia. The expansion will create an additional 12,000 square feet of space owned by “The Coop Group, LLC” a partnership of USPOULTRY and USAPEEC. The American Feed Industry Association released the results of its annual charitable giving survey. AFIA member company employees donated a collective 104,000 hours of their time to supporting community service projects in 2018 – a 13 percent increase over 2017. AFIA member companies, including company-employee matches, also donated over $56 million to an expansive list of community causes. A long-awaited scrapie rule was published this week in the Federal Register. The rule incorporates into regulation APHIS’ long-standing policy to use genetic testing to identify genetically resistant or less susceptible sheep for exemption from destruction and as qualifying for interstate movement. The rule takes effect on April 24, 2019. According to a survey by the National Hot Dog and Sausage Council, Major League Baseball fans this season are expected to consume about 18.3 million hot dogs and nearly four million sausages. R-CALF USA has sent a formal request to U.S. Attorney General William P. Barr urging him to block the proposed acquisition of Iowa beef packer Iowa Premium by National Beef Packing Company, which is now majority owned by Brazilian-based Marfrig Global Foods. 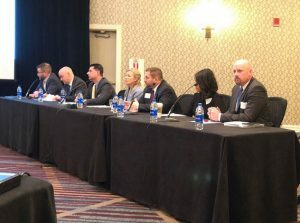 The Environmental Protection Agency held a hearing Friday on proposed regulatory changes related to retail sales of 15% ethanol blended fuel (E15) and the renewable identification number (RIN) compliance system Renewable Fuel Standard (RFS) program. Biofuels advocates, organization representatives and company officials testified at the hearing about the proposal and other related topics. Below are links to audio files from some of the witnesses. Renewable Fuels Association (RFA) president and CEO Geoff Cooper. 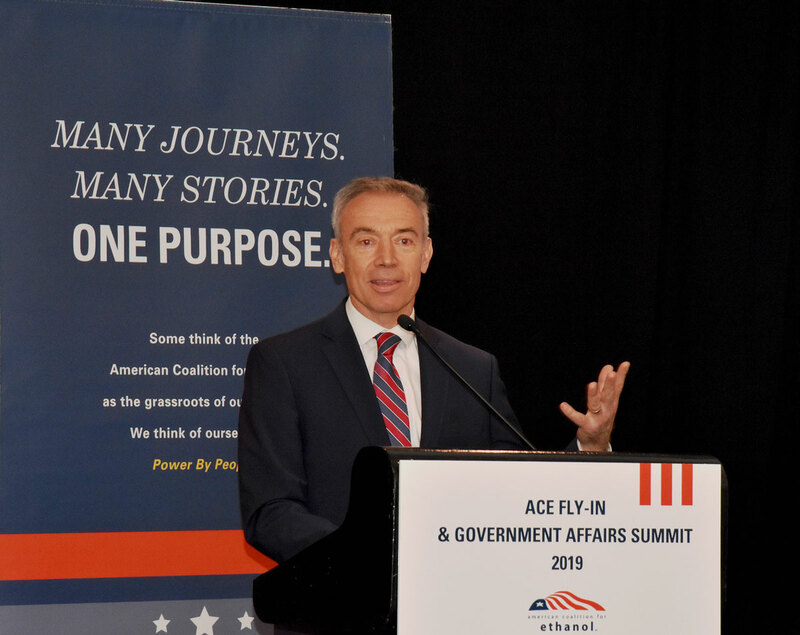 The National Agri-Marketing Association has named Zippy Duvall,President of the American Farm Bureau Federation, as the 2019 Ag Association Leader of the Year. The California Antique Farm Equipment Show® kicks off Friday, April 12 at 8:00 a.m. at the International Agri-Center® show grounds in Tulare, CA. The show runs Friday, April 12, 8:00 a.m. – 5:00 p.m., Saturday, April 13, 8:00 a.m. – 5:00 p.m., and Sunday, April 14, 8:00 a.m. – 3:00 p.m. In an effort to improve mental health support for farmers, ranchers and farm workers, National Farmers Union and a broad coalition of leading farm and rural advocacy groups are urging Congress to fully fund the Farm and Ranch Stress Assistance Network in fiscal year 2020. The American Farm Bureau Women’s Leadership Program has launched “Women in Ag,” an online survey that aims to gauge the goals, aspirations, achievements and needs of women in American agriculture in a variety of areas. All women who are farmers, ranchers, farm/ranch employees, employed in agricultural businesses, pursuing ag-related higher education or supportive of agriculture in other ways are invited to participate in the survey at fb.org/women. Respondents must reside in the United States. Farm Bureau membership is not required to participate. The EPA and Army Corps of Engineers are currently collecting comments on their proposed rule of the term “Waters of the United States (WOTUS).” The draft comments are intended for you to easily submit to the agencies before the deadline of April 15th. Submit comments here. Potatoes USA, the Marketing and Promotions Board for the U.S. potato industry, concluded its 47th Annual Meeting on March 14. Phil Hickman of Horntown, Virginia will serve a one-year term as Chairman, making him the board’s first Chairman from Virginia. EnviroMonitor is an award-winning sensor platform that helps farmers measure, monitor, and manage crops at every stage of the growth cycle. With the Davis Mobilize app farmers can monitor soil moisture and soil temperature to help plant with confidence, track growing degree days for each field by crop and plant date, and improve daily decisions with real-time field conditions. NewLeaf Symbiotics announces the hiring of three experienced agriculture leaders to its business development team. Dave Coorts has been named Director of Field Biology; Brad Walkup joins as Technical Sales Lead for the Western Region; and Caroline Currie will serve as Technical Sales Lead for the Eastern Region. At the Farm Foundation Forum on Tuesday, April 23, 2019, a panel of educators and industry leaders will discuss the innovative approaches they are taking to meeting the sector’s human capital needs. The Forum, Human Capital Challenges in the Food and Agriculture Sector, will be 9 a.m. to 11 a.m. EDT. CLICK HERE to register to attend the Farm Foundation Forum at the 4-H Center and/or the Ohio Agricultural Council gathering. To participate in the Farm Foundation Forum via the live webcast, register HERE. The webcast is made possible by a grant from Farm Credit. David Delaney has joined Farmer’s Business Network as Chief Commercial Officer. Farmers Business Network is an independent and unbiased farmer-to-farmer agronomic network that provides unbiased and democratized analytics to its 8,000+ American farmers, and now 500+ Canadian farmers. When it comes to what we eat at Major League Baseball parks, the top dogs for well over a century have been hot dogs and sausages—and once again, they will reign supreme in 2019. According to a survey by the National Hot Dog and Sausage Council, MLB fans this season are expected to consume about 18.3 million hot dogs and nearly four million sausages. New Ag International is looking forward to taking two conferences to Brazil in August 2019. InfoAg International Conference & Exhibition, a three-day event jointly organized with the International Plant Nutrition Institute, will run in Campinas, São Paulo State, Brazil from 26-28 August 2019. New Ag International is hosting two conferences to Brazil in August 2019. 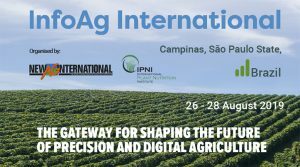 InfoAg International Conference & Exhibition, a three-day event jointly organized with the International Plant Nutrition Institute (IPNI), will run in Campinas, São Paulo State, Brazil August 26-28. This event will be followed by the largest biocontrol event in Latin America – the Biocontrol LATAM Conference and Exhibition, scheduled for Campinas August 28-30. For more information about the events, contact marketing manager Carmen Hernandez. Research conducted at Texas A&M University has shown wide-spread bollworm/earworm resistance to the majority cotton and corn Bt technologies and that cotton bollworms have developed resistance to pyrethroids to some degree in most of Texas. One of the insecticides recommended for growers to manage cotton bollworm populations is FMC Prevathon.